This is fascinating. I have the Book-of-the-Month Club 2-vol. 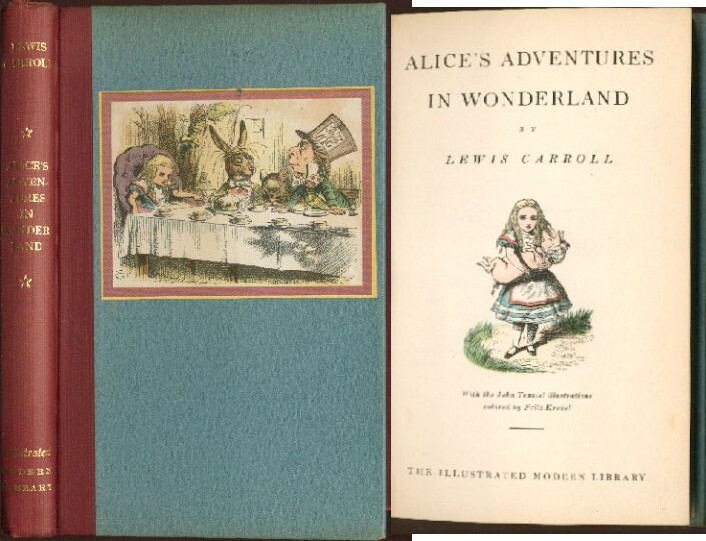 edition of Alice's Adventures in Wonderland and Through the Looking Glass, but alas I don't have a copy of the Illustrated ML Alice to refer to. As I've mentioned before, the Illustrated Alice used left-over sheets of the BOMC Alice (3,010 copies). The ML had to print a new title page (the BOMC edition used the imprint Random House on the title page) and they had to reprint the gathering consisting on pp. 39-50 which was missing in the BOMC copies. They also had to trim about an inch of the foot of the leaves since the Illustrated ML format was shorter than that used by BOMC. The ML created an entirely new binding design and acetate jacket for its issue of the BOMC edition (the BOMC volumes were slipcased). This front panel of this binding is different from the binding design on other Illustrated ML copies I've seen or seen images of. It's also different from the BOMC front panel. The only explanation I can suggest is that the ML ran out of the printed sheets they used on their binding and cannibalized a few copies of the sheets for the illustration used on the newly discovered front panel (it appears at the head of Chapter Seven (p. 76). 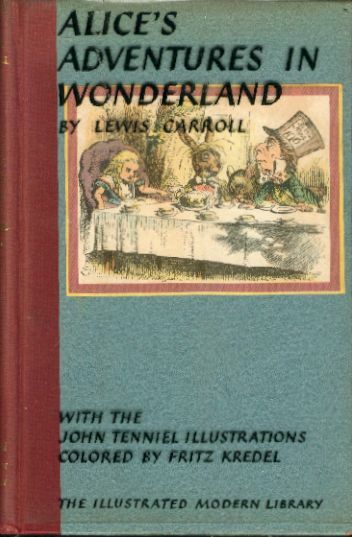 I'm also interested to note that the title-page illustration is different from the illustration used on the title page of the BOMC Alice in Wonderland. Since the ML had to reprint the title leaf anyway, they could easily have chosen a different illustration. The illustration of Alice holding the pig appears on p. 70. I don't remember what illustration appears on other title pages of the Illustrated ML Alice (as you see, I need my own copy to refer to!) ... could someone who has the Illustrated Alice confirm that it's the same one shown here -- Alice holding the pig?